Work Life Balance. Work Life Balance Challenge Work life balance challenges spring from our success: - Unique and pioneering initiatives - Scaling to. 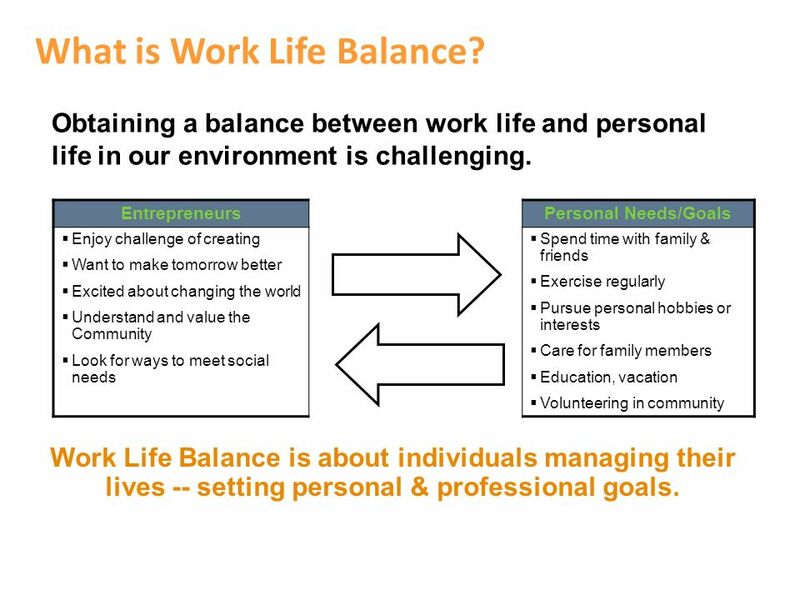 3 What is Work Life Balance? EntrepreneursPersonal Needs/Goals Enjoy challenge of creating Want to make tomorrow better Excited about changing the world Understand and value the Community Look for ways to meet social needs Spend time with family & friends Exercise regularly Pursue personal hobbies or interests Care for family members Education, vacation Volunteering in community Work Life Balance is about individuals managing their lives -- setting personal & professional goals. Obtaining a balance between work life and personal life in our environment is challenging. 5 Examples of things you can do to improve your life balance… 1.Set goals around your schedule and try to manage to this time-box. 2.Consider scheduling personal activities on your calendar to block off time for these important events. 3.Schedule time on your calendar to focus on important tasks – dont let other meetings consume your day so you can only do your work on the evenings and weekends. 4.Dont get pulled into email. Try to prioritize email along with the other items on your to-do list. 5.Keep in mind that sharpening the saw – exercising or reading can help keep you sharper at work than continuing to grind away non-stop. 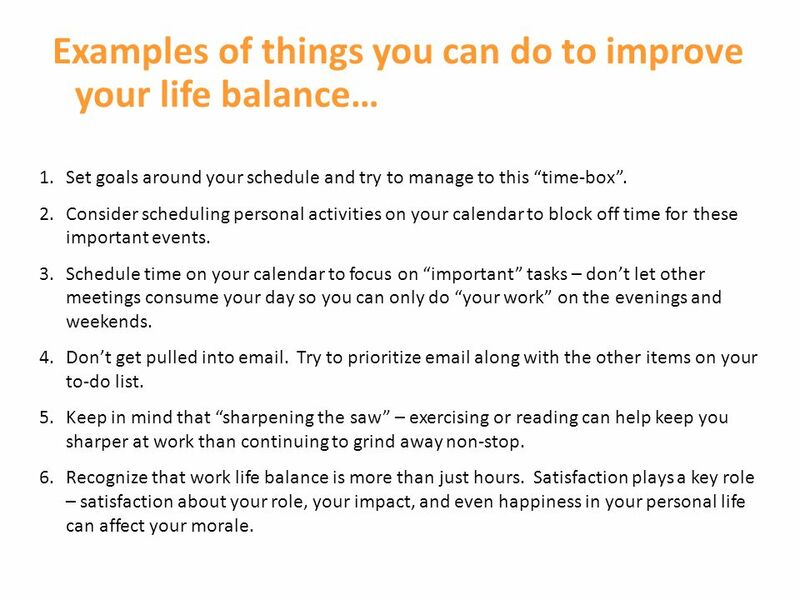 6.Recognize that work life balance is more than just hours. Satisfaction plays a key role – satisfaction about your role, your impact, and even happiness in your personal life can affect your morale. 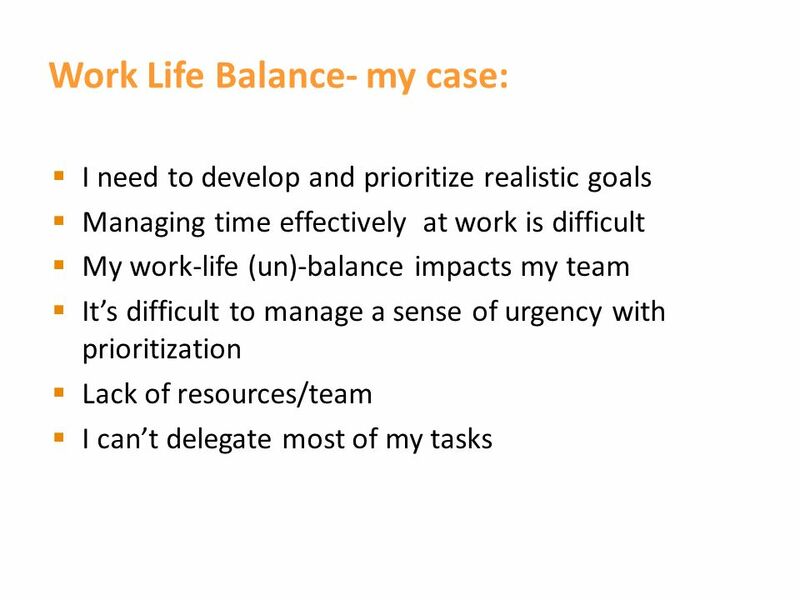 Download ppt "Work Life Balance. 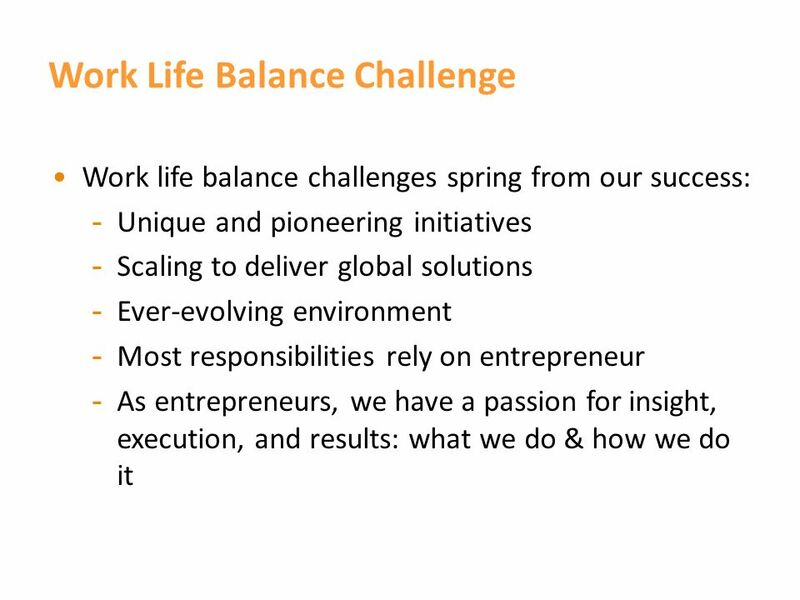 Work Life Balance Challenge Work life balance challenges spring from our success: - Unique and pioneering initiatives - Scaling to." Melanie C. Page Professor. Work with a partner/triad to define. Steps to Achieving Work-Life Balance Objective 1.04. Staff Professional Development June 5,  What is Working Smart?  Boosting Your Brain Function  Tips for Working Smarter  Brainstorm. Let’s look at our service system  Where are we now?  What is working and not working?  Where do we want to be in 2 years’ time?  Where do we need. Real Estate Marketing and Sales Essentials Steps For Success Dan Hamilton. Marriage and Family Life Unit 2: Making Personal Decisions. Mrs. Wills.  What does a good study space look like?  What does “time management” actually mean?  How can this help me?  What time is my “PLT” or. Leadership Lifesavers: Time Management Brought to you by: Title Slide 1. Chapter 3 Manage Your Time. Self-Management “It’s 7:30 am., I am late for class, and I can’t find my keys. It always seems like there’s too little time. Having Balance in Your Life. Is Your Life in Balance Quiz? Directions: Answer true or false to each statement below. 1.I find myself spending more and. “First Things First” Based on the best selling book by Stephen R. Covey Compiled by Warren Hunsberger Teen Challenge Training Course 301.01.